The use of mechanical and chemical processes for refrigeration began back in the 19th century. It was chemists who had known for some time that certain chemical reactions would absorb or divert heat which then would lower the temperatures in any given area. It was the food and beverage industry at that time that was in dire need of an alternative to the then costly and inefficient refrigeration method of transporting and storing ice. It was inventors like the American Thaddeus Lowe who created complex systems that used chemicals to draw out the heat from enclosed area that made a refrigerated compartment, that revolutionized the world of refrigeration. Mechanical refrigeration stores a certain amount of refrigerant gas or gases and then the device will create a controlled chemical reaction when it forces the gas to change state or draw heat from a compartment by combining with other chemicals. The early commercial and home refrigeration units once used ammonia and methyl chloride. These were highly toxic gases and often caused injuries if they escaped from the compartment. It was in the 1950s when the refrigerator was a common item in everyone's home that the toxic gases were then replaced with synthetic refrigerants they called chlorofluorocarbons. These synthetic gases were easier and safer to store and handle but they ended up with their issues. By the 1970s many studies showed that chlorofluorocarbons were contributing to the depletion of our ozone. So chlorofluorocarbons were soon banned world wide. With the continued advances in the world of refrigeration the industry has produced safer alternative refrigerants and much more efficient working machines that require a small fraction of the chemicals that were once used by the older units. 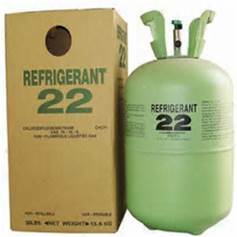 These older refrigerants are still required for any older unites that are still in use, like industrial freezers, they can't be converted to the modern refrigerants without the expense being far too much. So there are very strict regulations on the use, maintenance and disposal of these older refrigeration units.